Why not have breakfast al fresco? 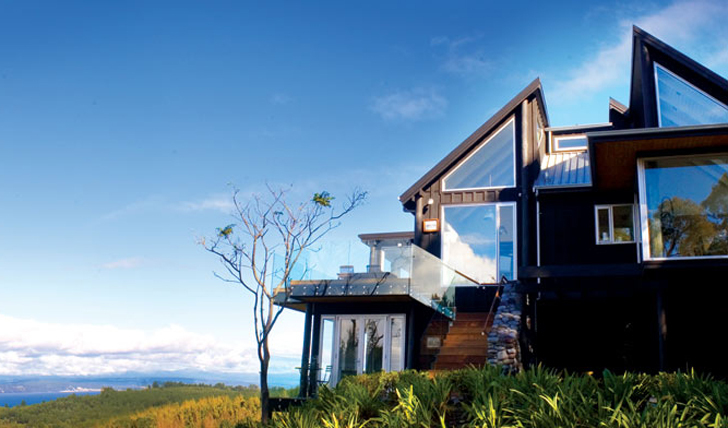 The sleek yet cosy Acacia Cliffs lodge consists of four suites perched up high over Lake Taupo, with great views of the glistening waters. Created with clean lines, white walls and plenty of glass, the suites are simple with a contemporary personality, including big sofas and floor-to-ceiling windows. 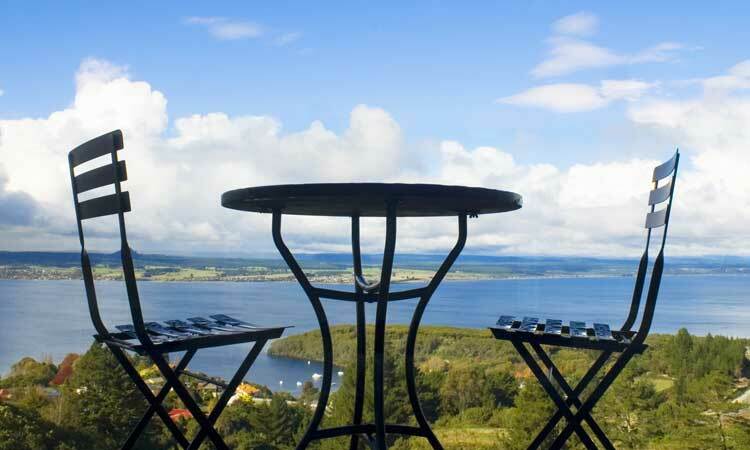 Set in landscaped gardens just six kilometres from Taupo itself, Acacia Cliffs is well positioned for peace and quiet as well as the activities of New Zealand’s largest freshwater lake. Three of the suites have lake views and one has a garden view, each with luxury designer bathrooms, outdoor decking space and fine linen beds with a choice of pillows. You won’t be stuck for entertainment in your room with your flat screen TV, CD and DVD player and free internet access. Included in the room rate are complimentary wine, beer and other refreshments, pre-dinner drinks and canapés, and a full gourmet breakfast each day (in bed if you like). The lodge faces east meaning incredible sunrises (the perfect match for your gourmet breakfast in bed) and small luxuries such as underfloor heating make your stay that little bit more special. We recommend borrowing the lodge’s mountain bikes for exploring the area too.